Brightens and reveals glowing skin. 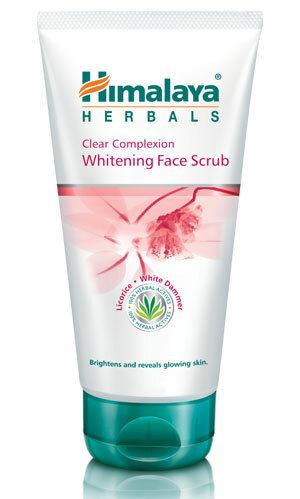 Himalaya Herbals Clear Complexion Whitening Face Scrub is a complexion enhancing scrub with mild exfoliants that brings out your natural fairness and reveals glowing skin. Licorice and White Dammer help regulate melanin synthesis while Apricot granules gently scrub away dead skin cells, blackheads and deeply embedded impurities. The result is visibly brighter, soft and glowing skin. Gently massage Himalaya Herbals Clear Complexion Whitening Face Scrub with fingertips in a circular motion over cleansed face and neck, avoiding the area around the eyes. Wash off and pat dry. Use 2-3 times a week for healthy, glowing skin. For best results, cleanse regularly with Himalaya Herbals Clear Complexion Whitening Face Wash and follow with Himalaya Herbals Clear Complexion Whitening Day Cream.